Coq au vin is a French braise of chicken cooked with wine, lardons, mushrooms, and optionally garlic. 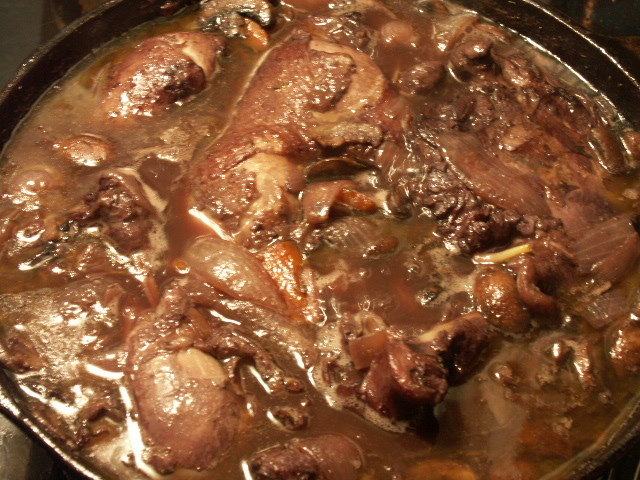 While the wine is typically Burgundy wine, many regions of France have variants of coq au vin using the local wine, such as coq au vin jaune (Jura), coq au Riesling (Alsace), coq au Champagne, and so on. Left: Coq au vin, before cooking. 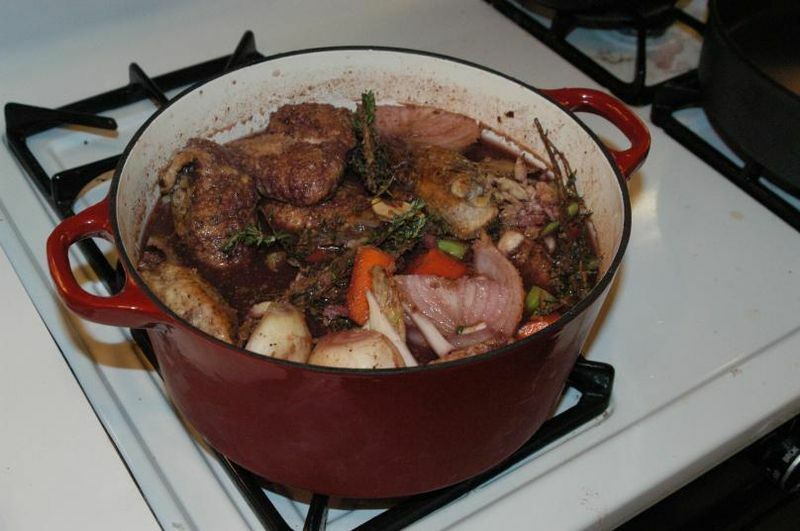 Various legends trace coq au vin to ancient Gaul and Julius Caesar, but the recipe was not documented until the early 20th century. In one of the earliest printed recipes, published in 1913, the text claimed the recipe dated to the 16th century. Left: Coq au vin, ready to eat. Although the word "coq" in French means "rooster," and tough birds with lots of connective tissue benefit from braising, most coq au vin recipes call for capon or chicken. Standard recipes call for a chicken, wine, lardons (salt pork), button mushrooms, often garlic, and sometimes brandy. (Recipes with vin jaune may specify morels instead of white mushrooms.) The preparation is similar in many respects to beef bourguignon. The chicken is first marinated in wine, then seared in fat and slowly simmered till tender. The traditional seasonings are salt, pepper, thyme, and bay leaf (usually in the form of a bouquet garni). The juices are thickened either by making a small roux at the beginning of cooking, or by adding blood at the end. Alternate preparation - at some American restaurants, this dish is prepared "on the pan", either saute or pan roasting.